It stands to reason that every game that has been published by serious people wearing expensive suits must have an audience. There are folks who build their careers on market research, learning everything they can about consumers’ likes and dislikes and feeding that information back to publishers and developers. I, therefore, choose to believe Senko no Ronde 2 has an audience. It is most assuredly not me. 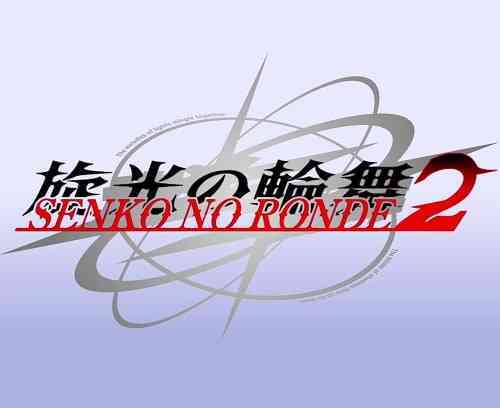 Senko no Ronde 2 is a 1-v-1 robot battling game, a sort of unholy union between a fighter and a bullet-hell shoot-em-up. Any second in which your screen isn’t full of projectiles is a second in which you’ll be wondering if your game has somehow frozen. Each combatant pilots a mech, known as a Rounder for storyline reasons which I won’t bother getting into because it doesn’t matter. Chances are if you are the target audience for Senko no Ronde 2, you’re not here for a compelling narrative; you’re here for the action. But there is a narrative, tucked halfway down the main menu and identified as Senko no Ronde DUO. A little digging in the built-in encyclopedia reveals that DUO was the sequel to Senko no Ronde, and Senko no Ronde 2 is, more or less, a “reboot” of that second game. Suffice to say, there is a story mode, which plays out like a visual novel, and it deals with a future world and amnesia and other anime tropes. It is not very good. Moving on. Arcade and Online/Offline multiplayer modes are where you’ll probably spend most of your time if I don’t convince you to flee for the nearest competent game. In Arcade mode, you’ll choose a character and fight your way through the other combatants, all the way up to a final battle against a morphing super boss. If you are at least somewhat skilled, you will finish Arcade mode in thirty minutes. While you can play through it again and again as each character, challenging yourself with higher difficulty levels, I wouldn’t blame you if you decided there wasn’t enough here to justify the time spent. Battles play out much the same, regardless of mode: blast your enemy from a distance with gatling guns or lasers or other special barrage attacks, raising and lowering your shield as necessary, and occasionally dashing in for a melee attack. You have a full 360-degree range of motion, but there are no obstacles on the battlefield, nothing to make your ability to move around in any direction more interesting. You move the way you do in order to allow you the merest chance of dodging your way through your opponents’ bullet hell monstrosities. Speaking of bullet hell monstrosities, that brings me to perhaps the coolest feature, B.O.S.S. mode. You have the ability to transform yourself into a giant boss-like character and go to town on your opponent, so long as you have the B.O.S.S. resource available. 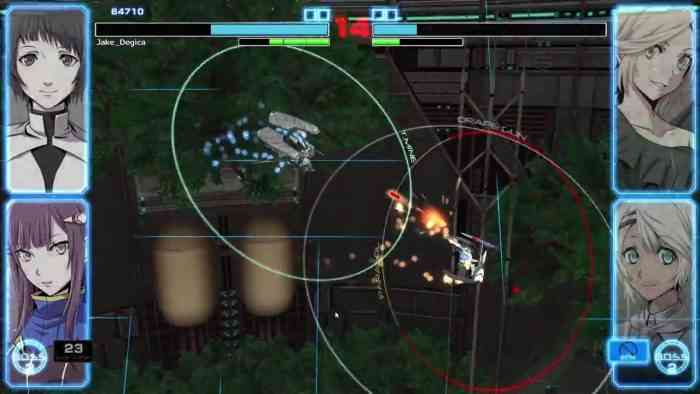 This is where we enter the deepest circles of bullet hell, as you unleash a crazy amount of firepower on your opponent. It only lasts for a short time, but it’s often enough to push you over the finish line, ending the battle in pretty spectacular fashion. Of course, your opponent has access to B.O.S.S. mode, too, and being on the receiving end makes you no less likely to meet an untimely death. Because of all the bullets flying everywhere, this is a game that lives or dies on its controls. It dies. Every thing, every movement and attack, feels imprecise. From delays before an attack launches to touchy dashing, it’s not an enjoyable experience. Trying to hit your opponent with guns or lasers as they move around the arena is frustrating, as your bullets move just slowly enough to allow the enemy to stay ahead of them. I suppose it wouldn’t be good if you couldn’t dodge, but movement artificially elongates every battle, and you’ll just want the damn thing to end already. So, the controls aren’t good, but what about the aesthetics? To put it simply, the graphics would not look out of place on the PlayStation 2. That is not a typo. This is a simple game, and a simple aesthetic is all it needs, so I won’t fault it for that. 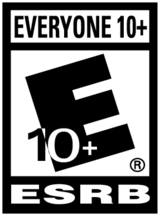 The screen is frequently filled with lasers and other flashy effects which push it to maybe a PS3 level of quality on occasion, but it’s not a good-looking piece of software. The music is repetitive and boring. The voice acting is Japanese only and largely unnecessary. It’s a game that both wants to have a narrative and simultaneously wants to disregard that narrative for button-mashing action. Why bother having voiced characters in Arcade mode if you’ve disregarded story altogether, anyway? I don’t have much more to say. 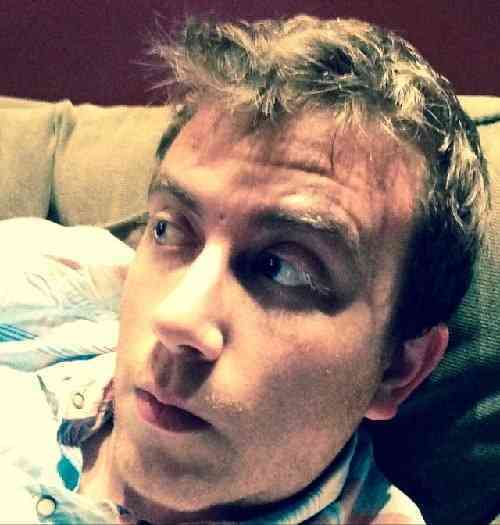 I came in cautiously optimistic, and I left bruised, battered, and brain-dead. Loose controls, bad graphics, and a painful narrative add up to a lousy time. If you’ve already bought into the Senko no Ronde franchise, you’ll probably find something to like here. No others need apply.